Businesses throughout the Twin Cities area count on a wide variety of commercial coiling doors because of the value they deliver at facilities of many kinds, including retail locations, warehouses and more. O&L Door systems offer coiling doors in Bloomington, MN and other communities in the Twin Cities area. We offer a huge selection of commercial coiling doors, as well as a number of overhead door services – repair of commercial coiling doors included. Don’t settle for anything less than the best when you need commercial garage door installation or repair of commercial coiling doors in the Twin Cities area. Choose the best when you select O&L Door Systems as your service provider. Our commercial coiling doors are available in a number of different options, which allows you to customize the look, feel and performance you need for your business. You can choose the right type of materials for your coiling door, as well as the perfect finish. We understand customers come to us with different needs, and we offer several coiling door options to increase the chances of having the right fit for your facility. A warehouse that needs a coiling door in Eagan, Minnesota, may have completely different needs than the retail location that needs a coiling door in Bloomington. At O&L Door Systems, we have the options you need. There’s a reason why commercial coiling doors are so popular at businesses and industrial organizations around the world. They roll straight up, which means they require little space for installation and operation. Commercial coiling doors aren’t like traditional doors that need clearance space. They are also highly durable, which means they are right at home in demanding, rugged environments. 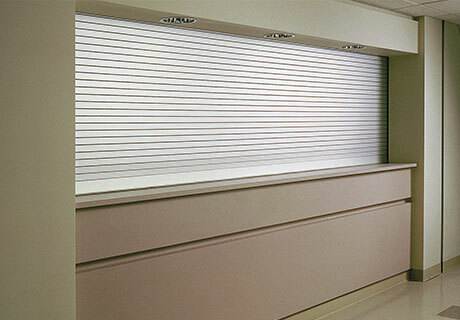 Commercial coiling doors require little in the way of maintenance. When you need a door you can count on, one that can take a beating and always delivers, choose commercial coiling doors from O&L Door Systems. For more than 20 years, O&L Door Systems has been serving the needs of businesses and homeowners throughout the Twin Cities area. We offer a huge selection of commercial garage doors, as well as outstanding customer service that’s focused on your unique needs and how we can meet them. We offer overhead door installation, repair and maintenance, and we’re always on call to help you – even in emergencies. Beyond our products and services, we can also serve as a trusted guide for businesses of all kinds. Many businesses know they need an overhead door solution, but they may feel uncertain about exactly which type of overhead door they need. We can provide expert guidance, pointing your toward your commercial coiling door options if that’s what will work best, or recommending something entirely different if appropriate. The bottom line is this: You can count on O&L Door Systems for all your commercial overhead door needs in the Twin Cities area.